While you may not have your dream bathroom in your dream house, likely you can make some improvements to your current bathroom that would greatly enhance it’s usefulness and beauty. Whether you are thinking of remodeling your bathroom to age in place, or you are just tired of the old fiberglass shower surround cracking, there are a number of things that you can do to make your bathroom more functional, and at the same time, more attractive. 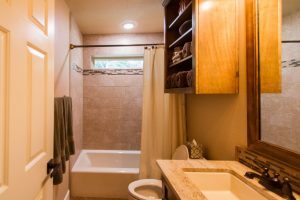 Here are a few questions that might help you in thinking through some of the decisions to be made on your bathroom remodel. You may find it helpful to think big picture first and down to the smaller details from there. 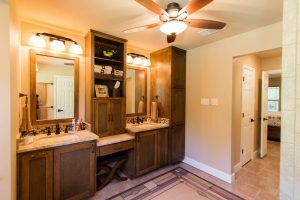 Why are you looking to update you bathroom? Utility purposes, aesthetically pleasing? Both? Do you need a shower instead of a tub? Or vise versa? If you are looking for a shower, do you need it to be roll-in to accommodate aging family members? Do you need more space around your toilet? Do you need a second sink? Do you like your flooring do you want new? Do you need more linen/other storage space? Do you like your current paint colors or would you like to update that? What about the color of your hardware finishes? At Cook & Son’s we are committed to making your dream a reality! These are some bathrooms we have done recently.